“Will & Grace” gave a first look at its numerous guest stars for its upcoming second season. Entertainment Tonight went behind the scenes to chat with Sean Hayes, Eric McCormack, Debra Messing and Megan Mullally. The sneak peek gave the season two plotlines which includes Karen (Mullally) divorcing Stan and Jack (Hayes) getting married to his boyfriend Estefan (Brian Jordan Alvarez). Grace (Messing) is seen going into politics and her new boyfriend (David Schwimmer) is introduced. 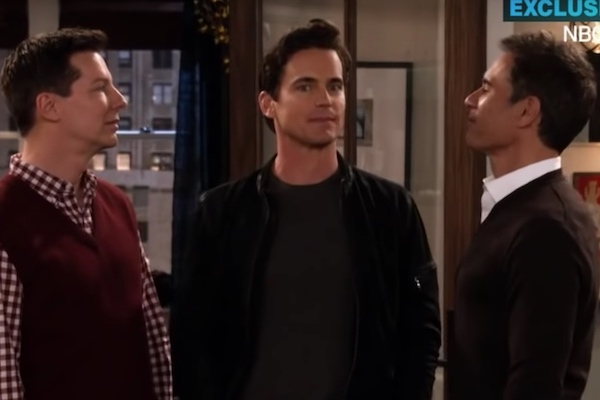 Will’s new beau (Matt Bomer) is also shown as well as other guest stars Alec Baldwin and Chelsea Handler. “Will & Grace” season two premieres on Oct. 4 at 9 p.m. on NBC.